It has been quite some time since Ouran High School Host Club fans were dragged into the fandom. The famed shojo series ended back in 2010, and its anime four years earlier. But that doesn’t mean netizens will not heed the series’ call and it is calling. Or, rather, Funko is calling for it. 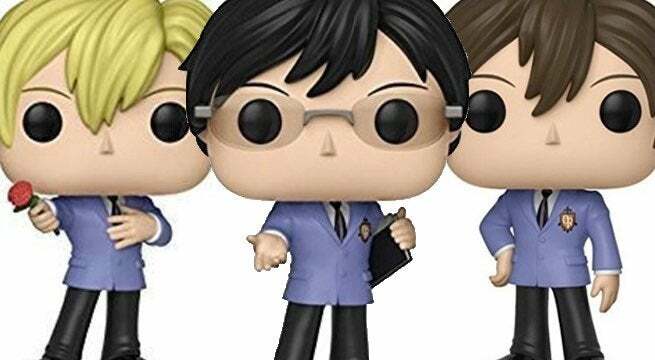 After all, Ouran High School Host Club is about to get its first set of POP toys. Over on Amazon, you can pre-order the Funko POP figures for yourself. The company is slated to roll out three different collectibles at the start of July. Tamaki Suoh, Haruhi Fujioka, and Kyoya Ootori are all getting adorable figures. As you can see below, Tamaki’s figure suits him perfectly as it does his blond hair just so. The boy can be seen dressed in his usual school uniform, and Tamaki looks plenty romantic as he holds out a rose with one hand. In Haruhi’s case, the cross-dressing girl is seen with her hair short here. Haruhi passes on a dress in favor of the boy’s uniform, and the look matches Kyoya’s save for her missing classes. The studious ‘Shadow King’ is also rocking his uniform, but he looks a tad sly thanks to his wire-frame glasses and notebook. If you are not familiar with Ouran High School Host Club, you have plenty of time to catch up on the story. The series debuted in September 2002 under LaLa. Bisco Hatori is the writer behind the shojo title, and Ouran High School Host Club has since become a staple of the genre. After Bones gave the title an anime run in April 2006, the series has produced several live-action adaptations along with audio dramas. As for the series itself, it follows a girl named Haruhi as the scholarship student attends Ouran Academy. The school is a haven for rich kids, leaving Haruhi to stick out. However, her plans to go unnoticed end when she finds herself in debt to the school’s host club. Her meek look makes its leader Tamaki think she’s a boy, so she begins working as a host in the club. So, as expected, things go awry when her gender is revealed and Tamaki falls for the headstrong heroine. Will you be picking up any of these precious Funko figures? Let me know in the comments or hit me up on Twitter @MeganPetersCB to talk all things comics, k-pop, and anime!